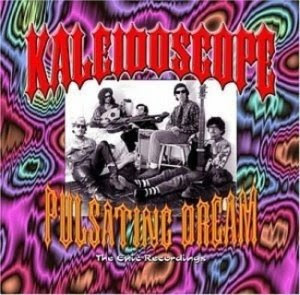 Kaleidoscope was an American psychedelic folk band who recorded 4 albums and several singles for Epic between 1966 and 1970. They are not to be confused with the British Psychedelic group Kaleidoscope. The original line-up featured Solomon Feldthouse, David Lindley, Chris Darrow, Chester Crill (a.k.a Max Budda, Fenrus Epp, Templeton Parcely) and John Vidican. Between them, they played a wide range of stringed instruments and world-music influences, deployed in their early psychedelic songs such as Egyptian Gardens and Pulsating Dream and then in longer pieces such as Taxim, which they also performed live at the Berkeley Folk Festival on July 4 1967. They were also unusual among rock bands in being able and willing to feature music by Cab Calloway and Duke Ellington in their repertoire. Their 1967 piece Stranger in Your City/Beacon from Mars, recorded live in the studio, was also influential, with Led Zeppelin admiring Lindley's controlled feedback solo. Darrow and Vidican left and were replaced by Stuart Brotman and Paul Lagos for their 3rd and 4th albums. The release, "Bernice," is deep, amazing psych with phenomenal electric guitar work that was missing from some of the other albums, and while it looks as though it may be more country influenced, which many of their albums surely were, this one is WAY overlooked. At the end of 1969, Kaleidoscope contributed 2 new songs ("Brother Mary" and "Mickey's Tune") to Michaelangelo Antonioni's Zabriskie Point.